ArcoLinux/ArchMerge could not exist without the contribution of the Linux community in general, the Arch Linux distro, the Arch Linux wiki, AUR maintainers and all the many creative and generous people in above mentioned communities. We adhere to the Trademark License of Arch Linux stipulated on this article. Thank you for your work and thank you for sharing all your creations with us. Jody James, known from the project Revenge OS, was kind enough to give us a kickstart back in ArchLabs beginning 2017 and provided us with a ‘template’ of an (Arch)iso. ArchIso is the tool to basically make an iso in Arch Linux. Then the ArchLabs team needed to give it its soul if you will. What is the look? What applications? Our thoughts are with you and we hope you are well. Jesse Avalos is a conky designer, who can make great aesthetic pleasing conky’s that are informative at the same time. You can check out his work at Deviant Art. This link will bring you to his really awesome gallery. He goes by the name of Speedracker there. Conky’s named JA-… are from Jesse Avalos. Thanks for creating and sharing them with us. Submicron or Fernando Cruz is the designer, who provided many of our coolest wallpapers. Follow him on deviantart. I selected only a few from his awesome collection. Go and see the other creations. On our first anniversary we received 1GB of wallpapers. 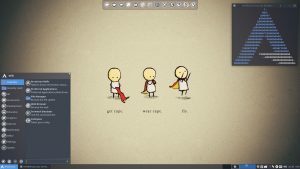 Nixiepro is an conky creator and designer. You can check his most recent work on Deviantart. Willem O is sharing his beautiful screenshots and conky’s on Google+. You can check out his latest creations there. Etles Team is a well know creator of conky’s. You can follow him on Google+. Creative people are always interesting to follow. Check out his deviantart gallery. Be amazed. You can also check out the opendesktop website to get more themes. Zagortnay 333 is sharing his beautiful screenshots and conky’s on Deviantart. Adhi Pambudi is a conky creator and a very creative desktop designer. Loves to tweak his desktops including tiling managers. Check out his latest creations on Google+ and on Deviantart. Some of the conky’s from the Aureola conky collection have been added. They are coming from the github of Erik Dubois. All the plank themes we currently have come from his github. Alejandro Camarena is the creator from the Halo icons that were included in the iso. You can follow his work on Google+ and here is his github. Duncan Pringle is superb in creating Openbox themes and creating awesome screenshots for openbox in particular but also others desktop environments. You can check out his latest creations on Google+ and get some inspiration. Many of the openbox themes we have are from his hand. You can find more themes on his github. Smoke King created many of the Openbox themes and is one of the developers in the ArchLabs project. You can follow his work on Google+. If I have missed some of our contributors then please accept my apologies already. Contact me via this website to get in touch again and we will add you to the list.